OSWEGO — David Crider, a SUNY Oswego communication studies faculty member, explores in a new book how radio announcers develop their on-air personalities, helping the nearly century-old medium endure even in the rapidly evolving live-stream and on-demand audio scene. David Crider of SUNY Oswego’s communication studies department explores how radio talent develops on-air personalities and why this culture helps drive radio’s long-running success, even in the current fragmented media landscape. 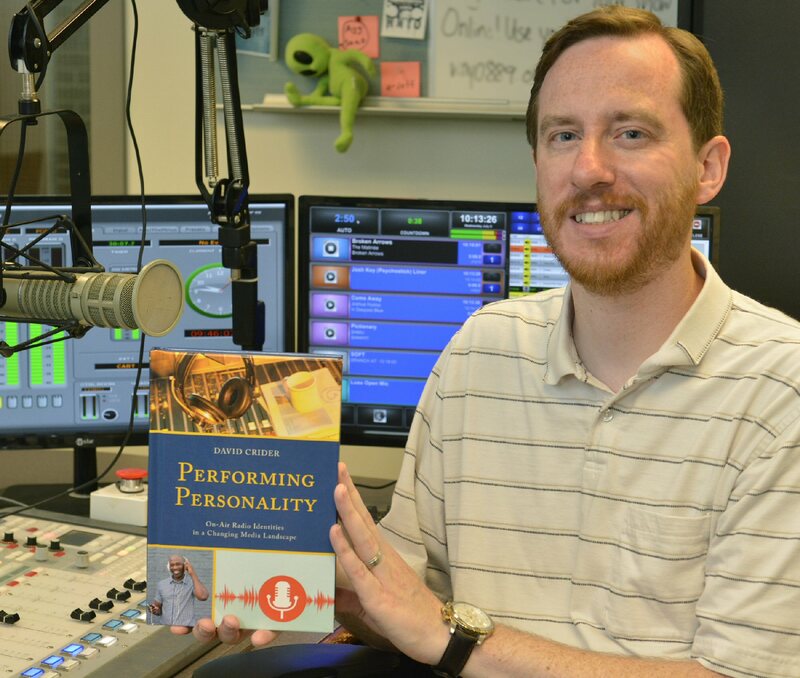 “Performing Personality: On-Air Radio Identities in a Changing Media Landscape” rests on a foundation of theoretical research Crider conducted for his 2013 doctoral dissertation in media and communication at Temple University. Yet his richly detailed on-the-job observations and interviews of a diverse sampling of radio talent opens the unique culture of on-air personalities to non-academic audiences. “The research really came out of all the questions I had when I was working in radio,” said Crider, who spent about 10 years in production and on-air positions at stations in Syracuse, in Hagerstown, Maryland and back in Central New York upon returning for a master’s degree at Syracuse University’s Newhouse School of Public Communications. Crider, who now teaches radio production and other mass media courses at SUNY Oswego and an online course at Temple, examines the construction of on-air personalities and the communities they create. He draws support for his painstakingly assembled case from the likes of talk radio megastars Rush Limbaugh and Howard Stern, Syracuse and Philadelphia DJs, sports entertainers and more. Inspiring the author’s own love of the medium and his early career path were radio personalities such as Bill Baker in Syracuse and Don Geronimo and Mike O’Meara of the nationally syndicated Don and Mike Show. “It was always the people who, when I listened to them, I thought, ‘They must be having so much fun, that’s what I want to do,'” said Crider, who so wanted to be on the air that he once turned down a production job at CBS Radio in New York City to work at a station in the nation’s No. 168 market, Hagerstown. Crider writes of deregulation, consolidation, downsizing and corporate missteps among traditional stations in the industry, but expresses optimism that on-air personalities will help this enduring modern media survive and thrive into the digital future. The key, he said, is relatability. “Performing Personality,” a 204-page volume from Lexington Books, builds on the platform of sociologist Erving Goffman’s theories on the dramatic presentation of the self in everyday human interactions. The bottom line is what Crider calls “the commercial imperative” — the show must meet audience and revenue targets, now and in the future.